The Terrebonne Parish Council was first seated as the governing body of Terrebonne Parish on January 9, 1984 when the Terrebonne Parish Consolidated Government became effective. The fifteen-member Council replaced the fifteen-member Terrebonne Parish Police Jury and the five-member Houma Board of Aldermen. Each Council Member is elected from a district which divides the Parish into relatively equal areas of population. From its ranks, the Council elects a Chairman and Vice-Chairman and appoints the necessary staff. 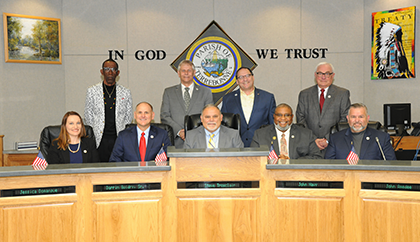 The Council is the legislative branch of the Terrebonne Parish Consolidated Government and, as such, is designed to serve as the policy-setting body of local government. Aside from the few (currently four) employees under the jurisdiction of the Council Clerk, the Council has no direct supervision of any of the employees of this government. Council meetings are normally held on the second and fourth Wednesdays of each month, beginning at 6:00 PM. All meetings are open to the public and anyone may address the Council, provided that they complete a speaker card prior to the beginning of the meeting, or call or send a letter to the Council Office requesting to be placed on the agenda. In response to a vote of the people in 1995, the Council was reduced from fifteen members to nine, with the first nine-member Council taking office in January of 1996. Committees-of-the-whole review many issues before they appear at the bi-monthly Council meetings. The five standing committees are Budget & Finance; Policy, Procedure & Legal; Public Services; Community Development & Planning; and Public Safety and Homeland Security Committee. Committees normally meet the Monday evenings before the regular Council meeting. All meetings are held on the second floor meeting room of the Government Tower Building 8026 Main Street and are open to the general public. The Council must comply with the provisions of the Home Rule Charter, Louisiana Revised Statutes and rules and regulations set forth by the governing body as a whole. Constituents may contact their Council members by calling the Council Office at a general number of (985) 873-6519, or by calling the elected officials at their homes.